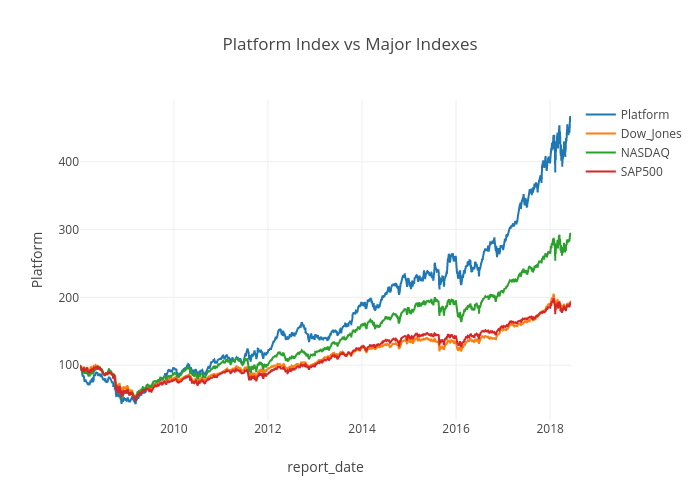 Roman55ff's interactive graph and data of "Platform Index vs Major Indexes" is a line chart, showing Platform, Dow_Jones, NASDAQ, SAP500; with report_date in the x-axis and Platform in the y-axis.. The x-axis shows values from 2008-01-02 16:00 to 2017-10-18 16:00. The y-axis shows values from 23.991111111111106 to 397.3688888888889.